Let me begin by thanking Ethiopia for convening today’s debate on the Situation in Afghanistan. I am also delighted that Ambassador Tadamichi Yamamoto is here with us today. Ambassador Yamamoto: thank you for your presentation – but more specifically – for your dedicated efforts as Special Representative of the UN Secretary General for Afghanistan. 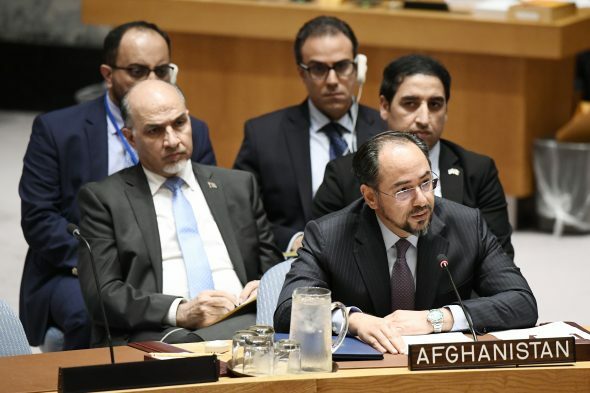 I am pleased to address the Security Council – my first time as Minister of Foreign Affairs of Afghanistan. This is a fitting opportunity to convey our appreciation for the Security Council’s support and attention to the situation in my country, since the start of our endeavor towards a new Afghanistan in 2001. The people of Afghanistan look to this Council with high expectation, as the guardian of international peace and security. Amidst all challenges, Afghans are hopeful that the international community, the UN, and this noble Council, in particular, will respond appropriately to help them achieve what has long eluded them: their right to live normal and dignified lives, in peace and security. The time has come for the international community to take a fresh look at its engagement in Afghanistan. As President Ghani stated in his address to the UN General Assembly last week, and I quote “for too long the conflict in Afghanistan has been viewed through the prism of civil war. But this war is not within our soil, it is over our soil”. The scourge of terrorism and violent extremism affecting Afghanistan is the product of a long-standing policy by a neighboring State to keep Afghanistan unstable. It has menaced Afghanistan for several decades now, with its roots located in terrorist sanctuaries and safe havens outside of my country. A bigger picture of the security situation reveals that our security forces are engaged in a comprehensive fight against elements of more than 20 internationally recognized terrorist groups. Thanks to the dedicated support of our international partners, our security forces are leading this fight more efficiently and with great valor and courage. The Taliban suffer major setbacks in manpower and morale and fail to hold ground over any territory. This is why their “modus-operandi” draws mainly on suicide bombings and other unconventional criminal attacks on our people, infrastructure, public figures, mosques and international humanitarian personnel. Such barbarity constitutes crimes against humanity – the latest being the massacre committed jointly by the Taliban and Daesh in Mirza Ulang village in Sar-e-Pul province and the attacks on mosques in Kabul and Herat. I wish to also highlight that the exaggerated claims of Taliban control over some percentage of territory is being used as part of psychological warfare. Our security forces have the upper hand against terrorist and extremist groups throughout the country. This trend will continue in a positive trajectory with sustained assistance from international partners to further strengthen the capabilities of our national security forces and improve service delivery for our people. We, in Afghanistan, have long called for an international focus that would address the fundamental sources of insecurity in our country. We are pleased that, as of late, there is a growing recognition of this imperative in the international community. This new dynamic presents an unprecedented opportunity, which must be seized. In this regard, I can say with confidence that the new Strategy of the United States for South Asia has generated new hope among our people across the country. Afghans from all walks of life are looking to the future with renewed optimism that finally the threats of terrorism and extremism in Afghanistan and the wider region will be tackled appropriately. In this connection, we welcome the fact that the new Strategy recognizes the critical need to address the lingering problem of terrorist safe-havens and sanctuaries in our region; and for more determined efforts to end political, logistical and financial support enjoyed by terrorist groups. Furthermore, the Strategy’s conditions-based approach has addressed some uncertainties by reinforcing the right message that the international community’s engagement will endure until Afghanistan becomes stable and secure. We urge all partners in the region and beyond to recognize what is at stake. We now have a chance to fundamentally change the status-quo for our common benefit. The support of the region, in this regard, will be of paramount importance. Collectively, we should seize this opportunity to strengthen consensus and partnership, in a spirit of cooperation to buttress Afghanistan’s rightful status as an asset and platform of cordiality for all. 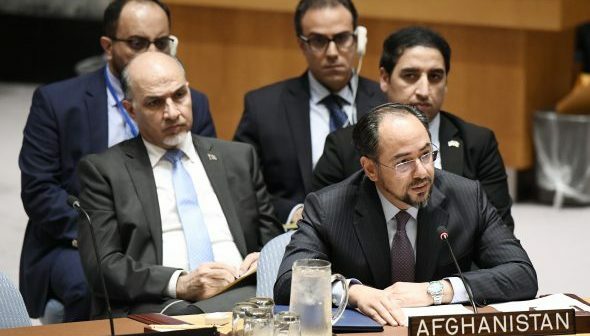 Despite being on the receiving-end of provocative actions, including continuous violations across the Durand Line, Afghanistan has maintained a principled position in seeking to resolve differences through dialogue, diplomacy, and peaceful means. This is particularly true in the case of our relations with Pakistan, which – unfortunately – has so far failed to respond positively at its own cost, particularly in relation to its global reputation and standing. Recently, we presented Pakistan with yet another opportunity to engage in comprehensive State-to-State discourse on peace, security and prosperity. We hope – this time around – we will see a constructive engagement instead of plausible deniability and attempts to change narrative. An opportunity, even if embraced late, is nevertheless better than one lost. There are various existing initiatives in which productive talks could take place. By the same token, we will spare no effort – whatsoever – in the defense of our country, our people; territorial integrity and national sovereignty. Ending violence means ensuring the security and well-being of our citizens. The Government of Afghanistan has gone to great lengths to secure a sustained and durable peace for our people. The prospect of peace with the Taliban is dependent on genuine and constructive regional engagement in support of an Afghan-led process. In this regard, we believe a paradigm shift could profoundly impact peace efforts with the Taliban in a positive way. A successful outcome, modeled on the agreement being implemented with another armed opposition group can be possible. We believe the international community should take necessary measures to achieve this aim. Democratic institutions, values, and principles provide the foundation for all progress made over the past 17 years in Afghanistan. We believe a democratic society where people are able to express their ideas, grievances and aspirations is not just a privilege, but also an imperative for social stability. The consolidation of democracy and institution-building will remain a priority in the Government of National Unity. Our people are already anticipating the up-coming parliamentary and district council elections next year. The transparency, inclusivity, and credibility of the polls will be crucial for our overall political stability. In the area of reform, we are standing by our commitment to ensure more accountable and effective institutions. A number of senior-level officials have been prosecuted and held to account for violating the rule of law. These cases have reaffirmed our promise to root out corruption, in all its forms, and enhance public confidence in our reform commitments. This effort will continue with priority, and we look forward to highlighting recent achievements in this area at the up-coming Senior Officials Meeting in Kabul to review reform commitments made in Brussels. We consider the Strategic Review of UNAMA’s activities to be an essential initiative for ensuring an adjusted UN role that is more responsive to the current day needs of the Afghan people, and better aligned with our national priority programs. We are pleased that the imperative of a One-UN model, concerning the delivery of development assistance has been recognized. We hope to have, by the end of this year, an outcome that will enable the UN to deliver on its task more efficiently. Our stabilization endeavor is based on a simultaneous effort for progress in the security, social and development spheres. Despite our challenges, we are making steady progress to protect and uphold the rights of all of our citizens, especially women, girls and children. Our resolve in this important area is reflected in our candidacy to the Human Rights Council. For us, a commitment to human rights means enabling people to live in peace and security and to achieve success and meet their aspirations. Above all, it means enabling people to live in honor and dignity. These are ideals to which we are firmly committed. Our membership in the Human Rights Council will have many benefits: it will enable us to consolidate human rights gains at home. It will also enable us to be a voice for victims of terrorism and the dozens of countries that are in conflict and post-conflict situations. We kindly urge all UN member States to support our candidacy. In conclusion, let me convey the deep appreciation of Afghanistan to the Security Council and the international community for all that you have done, and continue to do in support of Afghanistan’s security and stability. We stand at the crossroad of our shared endeavor. At this juncture, as we approach the New Year 2018, it is imperative that all of us seize the opportunity in front of us, brought about by the new spirit of the international community’s engagement in our country.